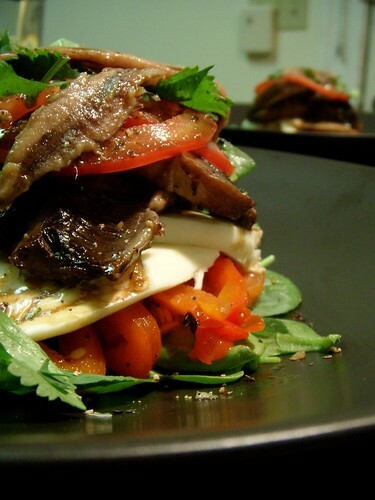 layered caprese salad with broiled portobello mushrooms fresh fire roasted red peppers and cilantro, originally uploaded by aarn! +4th November, 2008+. tossed some thick slices of portobello mushroom in a mixture of canola oil, crushed salted garlic, and lemon juice, and placed them on a pan under the flame of the broiler for about 5-minutes per side, then stuck them in a bowl covered in tin foil to cool to room temperature while the rest of the salad was being prepared. took a healthy looking red pepper and charred the entire outside on the open flame of the stove until the outside was flaky and black, then placed in a sealed tupperware for 10-minutes, removed, sliced in quarters and removed seeds, wiped off charred skin, and sliced julienne style. plated a bed of baby spinach, topped with the sliced fire roasted red pepper, then a few thin slices of fresh mozzarella, some of the broiled mushrooms, a layer of thinly sliced red tomato, a dash of fresh chopped cilantro, a few anchovies, and put a splash of balsamic over the top. served with a nice thick slice of spongy italian bread.